The LV-MaxSonar®-EZ4™ has the narrowest beam and is least sensitive to side objects of all the sensors offered in the LV-MaxSonar®-EZ product line. The LV-MaxSonar®-EZ4™ (part number: MB1040) high performance ultrasonic rangefinder is easy to use while offering customers versatility in a sensor. 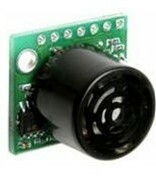 The LV-MaxSonar®-EZ products also operate with very low voltage from 2.5V to 5V with less then 3mA nominal current draw. The LV-MaxSonar®-EZ4™ is an excellent choice when only larger objects in front of the sensor need to be detected.